Authentic and Auspicious | Food and Drink | Style Weekly - Richmond, VA local news, arts, and events. 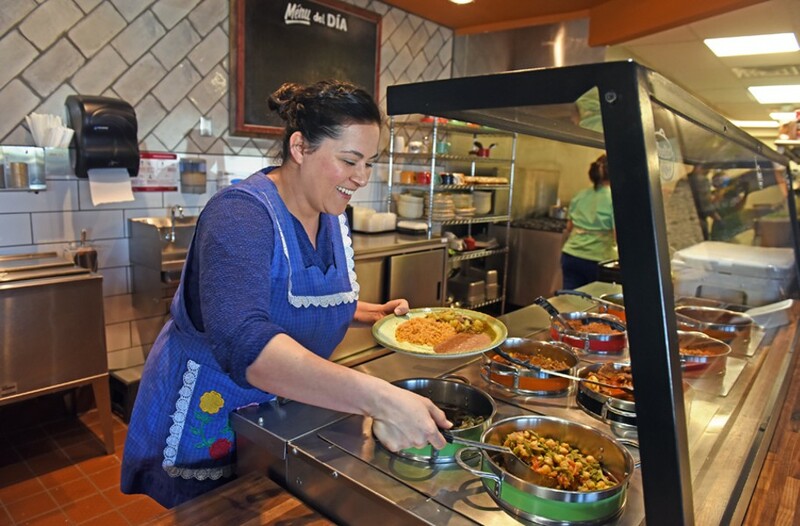 Scott Elmquist Owner Karina Benavides serves up classic Mexican stews and sides at Abuelita’s. As I stood in line for counter service recently at Abuelita's restaurant, an acquaintance assured me that the food was authentic. Before I pick apart what makes Abuelita's worth visiting, allow me to pick a bone with that word. A quick poll of my friends defined it as "traditional Mexican food cooked by a person from Mexico." Well, that's a problem for several reasons. By that definition, two of Richmond's most revered restaurants, Lehja and Peter Chang, aren't authentic. Natives of India and China have eye-rolled me about both, insisting the food is more a creative interpretation than traditional. Also, Mexico is a diverse country with many types of cuisines, and some of it is pretty bad. For example, one common snack or light dinner I have shared frequently in Mexican homes and restaurants is a "sincronizada" — basically a grilled cheese with sliced ham on a flour tortilla or white bread, sometimes with a pickled jalapeño. A ham and cheese quesadilla is something you might get at Applebee's, and the ones I had in Mexico were boring, but they're 100 percent authentic. The best street food I've had in Central Mexico shares many flavor notes with Thai and Vietnamese food — grilled meat brightened by lime, cilantro and chili. That's what I look for in a good taco. But that is not Abuelita's style of food, which may surprise Richmonders looking for familiarity. Abuelita's offers homemade guisos, or stews. This is classic comfort food in Mexico: meats, vegetables and tomato sauce simmered for hours in a clay pot on the stovetop, then ladled into deep plates or shallow bowls. It's food I've had more often in Mexican homes than in restaurants, and Abuelita's makes it quite well. The guisos are made fresh daily, so the menu changes. One guiso with sides is $7.99, two with sides are $9.99. On one visit, the poblano and corn in cream sauce was the group's favorite, with strips of roasted poblano chilies and onion. The mild sweetness of the corn married well with the mellow heat of the poblanos. A stew of chicharrones with roasted tomatillos was a standout for the rich bite-sized chunks of pork belly and the smoky tartness of the sauce. We also loved a flavorful vegetarian stew, made with zucchini, onions and corn, speckled with dried oregano. The steak with nopales guiso was flavorful, though it needed a bit more salt. The beef pieces were braised until tender. The nopales, or cactus pads, were fresh, with more body and flavor than canned. I usually avoid nopales because they tend to be slimy, but these I would happily eat again. They're available as a side dish for $3.99. Our group panned the chicken tinga. I prefer the tinga I learned to make in Mexico — thick and rich with plenty of onions, pureed chipotle peppers and adobo. Abuelita's tinga was thin and runny, with only a hint of heat. When I ordered an individual guiso ($3.50), the stew came ladled directly onto a fresh tortilla, which gave the whole thing a soggy texture. Instead, ask for tortillas on the side and build the taco yourself, a bite at a time. Abuelita's tortillas are made in-house from Maseca mix, a dried nixtamalized corn. Maseca is commonly used in the U.S., and increasingly in Mexico (although many families buy the day's supply from a local tortilleria), but it's a disappointing shortcut. Maseca tortillas can't compare to the deep flavor of tortillas made from fresh masa, like Ula Tortillas, which are made in Virginia. The rice and beans at Abuelita's were far better than bland versions I've had elsewhere. The rice had some welcome tang from the tomato sauce. But on a subsequent visit I skipped those sides in favor of an extra guiso. After ordering at the counter — where smiling servers patiently explained every stew several times, and even offered tastes — we sampled the half-dozen options at the salsa bar, from hot to very hot. Definitely get the pickled onions with jalapeño. An agua fresca ($2.99) made from tamarind was sweeter than I have had before, an adjustment I'm guessing was made with the Richmond palate in mind. The decor is charming, with colorful tile floors and walls, and a hanging collection of traditional clay cooking pots known as cazuelas. Although Abuelita's doesn't offer table service, servers checked on us several times, offering to clear empty plates and asking if we enjoyed our meal. Is Abuelita's authentic? Maybe, but so is a bland grilled-cheese sandwich. The more important point is that the food at Abuelita's tastes good. And ultimately, that is the best guide for judging any restaurant. Tuesdays - Saturdays 11 a.m. – 8 p.m.
Sundays 11 a.m. – 7 p.m.